At How Afghanistan Might Turn Out. After General McChrystal's sacking we learn that the much heralded Marjah offensive was regarded by the good General as "A weeping ulcer". What is it about the ruling elite that they are like rapists who fail to understand no means no. No more failed effort at great cost in this blighted, war torn backwater of history. Karzai is just a puppet being groomed as a potential Bilderberger lackey as he amasses huge fortunes in Swiss banks ready for the inevitable fleeing from the wrath of his fellow Taliban countrymen. They will not tolerate his corruption, money laundering and drug operations. So, first of all he has to go in return for a ceasefire agreement, a negotiated and financial pact with the Taliban, to include elections in which they are represented. Any agreement should involve aid packages available only for as long as terrorist groups and particularly Al Quaeda, are excluded from that land. Coalition forces should be made available to patrol with Taliban/Afghan forces to reassure the people that no one will be seeking vengeance. All of this should include an eventual UN presence combining Pakistan and Indian, as well as Russian and American soldiers. That is all those who have and continue, to date, to royally f**k this Nation. Over time all outside UN personnel withdraw, as peace evolves and money is spent on other than military and violent conflict. Of course this might make the wheeler dealing and vested interests of the corrupt influences, so much a part of American Globalisation tactics, shout and whinge. Still, as Banned remarked in my previous post, Chinese, Brazilian and Indian commercial muscle is taking over the world's trade as we idiots fight wars against Islamic windmills. If it were not so tragic it would be almost funny. This picture emphasises that remark, taken in July last year. It is to be repeated almost daily unless somebody grows a pair of balls. I'm not holding my breath. Not so much an amateur attempt as a naive one. Seeing as the Taliban can get everything they want (i.e. total control of the country; exile or death of Karzai; continued tight alliance with Al Quaeda; no Western presence to restrain them; humiliation of the US Army etc) by just carrying on doing what they are doing for another year or so and watching Obarmy cut and run as the butchers bill continues to mount...why would they make any of the compromises you suggest? Tend to agree with both of you, gentlemen. 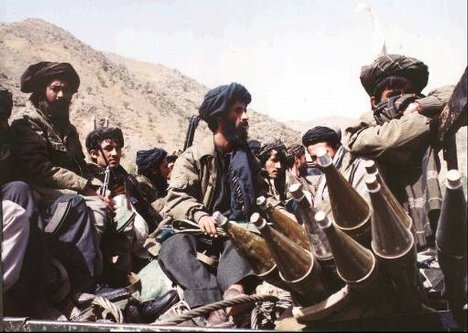 The Taliban will take anything that is offered to them and give virtually nothing in return. They have no need to offer anything because they can afford to wait, confident in the knowledge that the invading armies will have to go home at some point. More likely sooner than later as the blood and treasure is not unlimited. Does this remind you of anywhere? How about the six counties. We are treated to the image of known murderers and terrorists being feted in the name of peace - as splendid an example for the Taliban to follow as any I can think of. Despite all the puffery, the IRA gave up nothing and they know it. Similarly, the local populace have to live with the eventual winners. Who can blame them for hedging their bets? So yes OR, they will, Inshallah, accept gifts of cash most gratefully. But we'll get bugger all for it. And on that sombre note I feel that my blood alcohol level has fallen to a dangerous low and must be tended to. Caratacus, much as argued by John R. and in the main I fully agree. As for the six counties, very much a similar situation, indeed. Oh, give over the Bilderberger stuff! Rational analysis and conspiracy obsession do NOT sit together.